Order Geordie Yorkshire Bitter Kit from the Stirling Homebrew Shop UK. 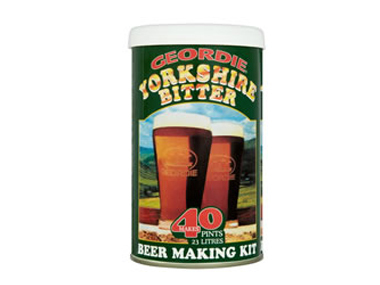 Buy Geordie Yorkshire Bitter Beer Kit - Makes 40 pints and other Beer Kits & Cider Kits safely online in the UK. Make your own beer at home! This beer kit makes 40 pints (23 litres) of bitter beer. Includes instructions and the necessary chemicals. Only add sugar and water. Where to buy Geordie Yorkshire Bitter Kit safely online? Shop at the Stirling Homebrew Shop if you are wondering where you can buy Geordie Yorkshire Bitter Beer Kit - Makes 40 pints safely online in the United Kingdom. Geordie Yorkshire Bitter Kit - Geordie Yorkshire Bitter Beer Kit - Makes 40 pints in Beer Kits & Cider Kits and Homebrew.